Does Your Business Stand Out In The Email Inbox? 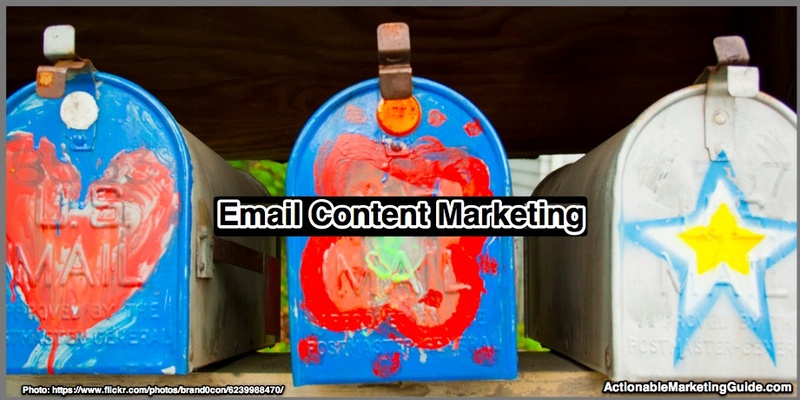 Check your email inbox and you’ll see everyone’s gotten the email content marketing memo. Astute marketers know email addresses are the marketing gift that keeps on giving. Specifically if you send a promotional email, you’re sure to generate sales. (Unless you abuse this privilege by over-mailing causing recipients to unsubscribe.) This is why Content Inc author, Joe Pulizzi, laser-focuses on his email acquisition numbers. Yet many of these marketers overlook the power of email content to build relationships with prospects, customers, influencers and readers. While I still get promotion-filled Teflon emails, selling stuff that quickly gets marked as junk, I’m finding more quality content from unexpected people and businesses, like my doctor. I agreed to let my doctor email me appointment reminders. They’re useful and avoid robocall reminders. So I was surprised to receive this useful information update about diet. 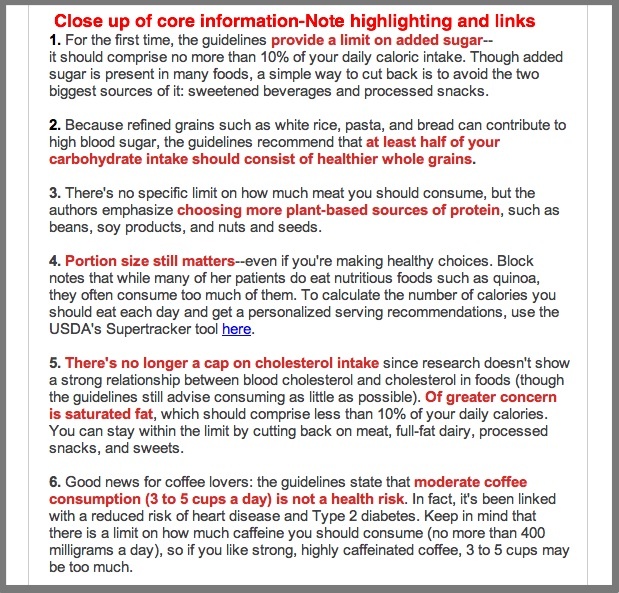 Highlighted key points in red. 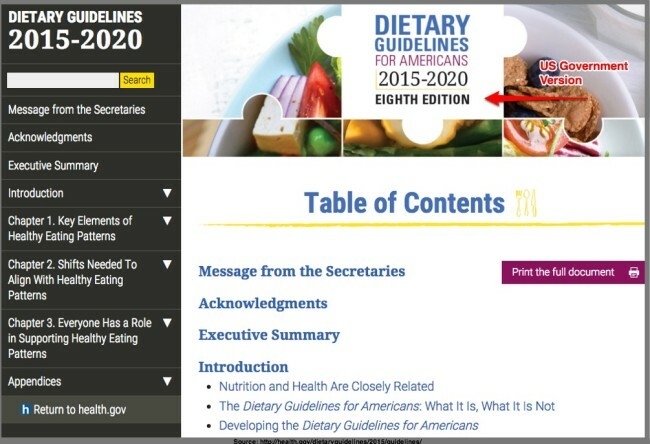 Written by a nutritionist, a trusted source for this type of information. Has my doctor’s branding. It helps they’re associated with a major NYC hospital. Used a templated format, although many emailings do. Contained stock images. It’s a safe option for a large organization like a hospital. 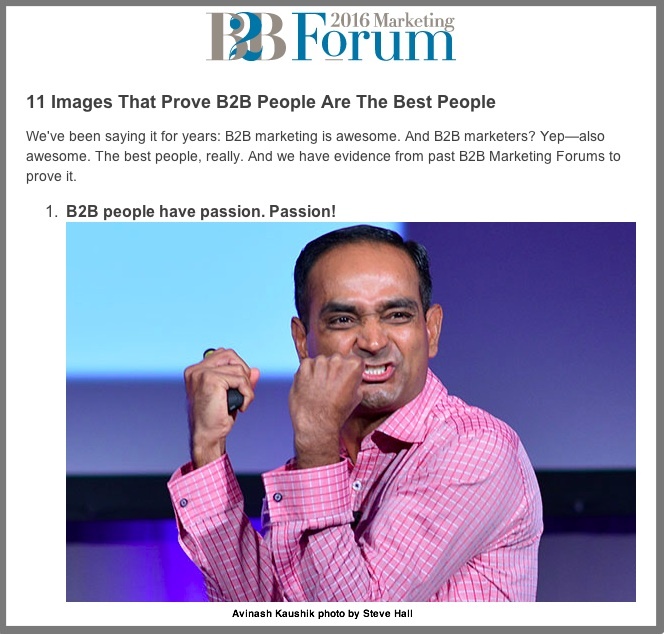 Bottom line: I read, remembered, shared and acted on this email content marketing. That’s a home run in my marketing scorebook. Simplify existing government content for your subscribers. Every business should be on the lookout for this type of information. You have simplify and make it easy-to-read. Don’t forget to link to the original and give them credit. Jay Baer calls this Youtility. 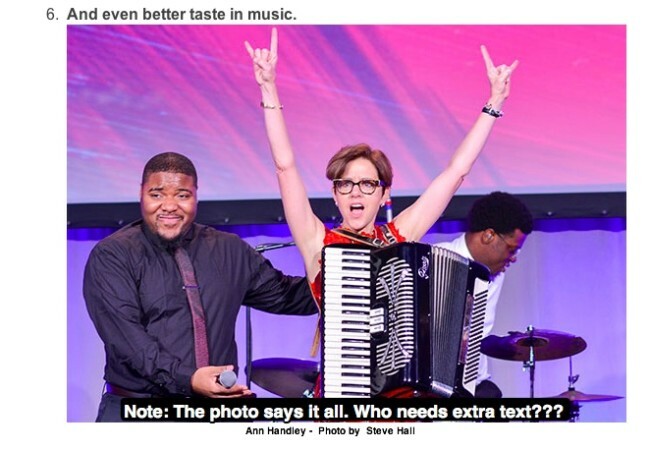 What does this mean for your email content marketing? The subject line says it all: Images and people. The email does what great content marketing should do. It has a unique personality and pulls the reader in. The photographs not only put a human face on MPB2B but also they have emotion. What’s missing? An over used email template and a ton of text. Make the photographs and the email content sharable. People want to show that they’re part of your tribe. To share these photos, I have to work to make them social media friendly. Most of your audience won’t do that. 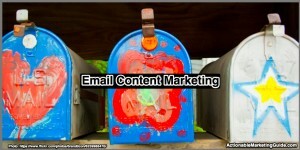 Want to give your email content marketing a boost to yield better results? Incorporate these 7 actionable tactics into your email marketing. Otherwise your email is trash. Literally. Don’t forget to tell your audience: What’s In It For Me (aka WIIFM)? Don’t limit your email communications to sales push. Even though your content isn’t focused on making a sale, you’ll lay the foundation to develop relationships with your community by making them feel that they know you. 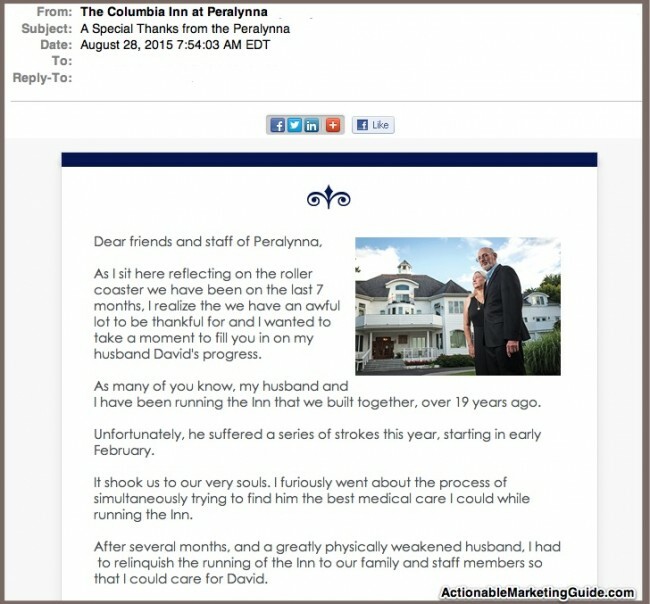 Dodaro confided that she always included a personal note in her email newsletters since these communications resonate with her readers. They make readers feel like they know her personally, even though she hasn’t met many of them. Based on Dodaro’s advice, I started sharing more personal stories in my weekly Actionable Marketing Guide newsletters (Sign up here!). Note this doesn’t give you permission to over share. Don’t make your private life public. Here’s another traditional form of correspondence to which any newlywed can relate. Write a note. Tell your customers: thank you! I’m not talking about auto-responders that check up on whether you’ve received the product or are willing to review it. Write an email message that your customers will open. Give them help to make their purchase more useful to them. I received an email from the owner of an inn where my husband and I stayed in Maryland, a quiet gem of a place. While we were at the inn, we never met the owner. The staff (especially her grandson) was gracious. Attention remains your audience’s scarcest resource. You have to earn the ability to appear in your subscriber’s inbox with every email. Remember there’s LOTS of competition to get into the email inbox. Don’t forget, it’s not just your competitors! It’s every other person or business that wants your audience’s attention. You must earn your audience’s trust. This means don’t just add people to your list without their permission. This doesn’t mean buying. It can be sharing on social media or via email. Remember it takes multiple impressions before people purchase. Email is one of the biggest activities people do on a smartphone, especially people who have work email addresses. The email content marketing bottom line: Offer your email subscribers more than just promotional push communications. Where possible, get personal by showing your readers insights from your personal side. 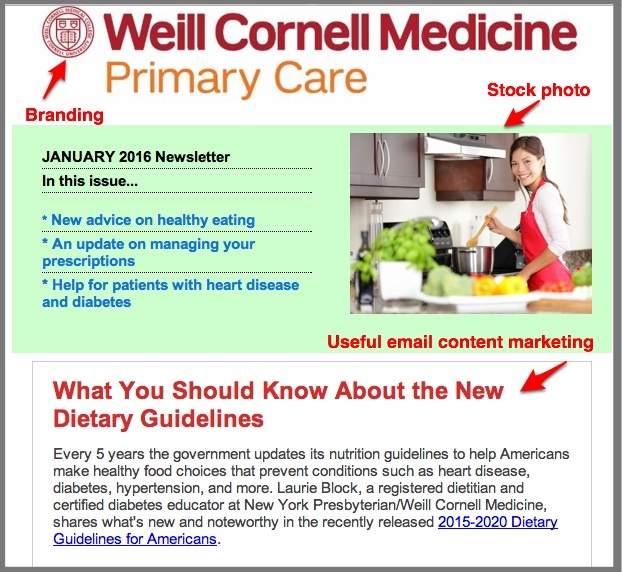 What email content marketing resonates best with your readers and why? Tags Ann Handley, Jay Baer, Jo Roberts, Joe Pulizzi, Melonie Dodaro, Noah Kagan, Rob Zaleski. Bookmark the permalink. Great article. I shared this all over. How can we measure the success of a marketing email? Any numbers? Thanks for this timely article! I’m doing a webinar on boosting email subscribers, but a section will be on what the heck do you do with them after you have them. I can use some of these tips for my students. Cheers!